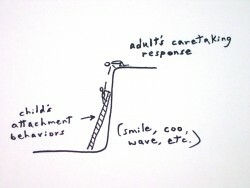 Robert captures attachment styles and Blocked Care in pictures in his unique doodles. You might remember Robert's first Doodles on "Intersubjectivity Without Words". We've now added Robert's second Doodles "Attachment Styles & Blocked Care" to the DDP Resource Library where you can access a downloadable Power Point version and a pdf version. The power point slide show will be downloaded directly onto your laptop or computer so please look for them there. These were first shown by Robert at the 2014 Canada DDP Conference. These Doodles are reproduced here by popular request of the Canadian DDP conference audience and with the kind permission of Robert Spottswood.